VoiceNation is a company unlike any other. We pour the same Passion, Innovation, and Excellence we give to our customers into our people. We LOVE our people and are always working to make a difference in the lives of others. And we realize our amazing team is what makes it possible to provide YOU with the service we do. It all begins with our culture. We do all we can to give our employees an environment where they can be happy and thrive. Why? Because we are a family. We want to WOW our employees with the same service they give to our customers. We want to meet their needs, give them an avenue to live out their passions, and build relationships with them. Relationships are such a huge part of our business and it’s important for our staff to build relationships with our customers as well. Here at VoiceNation, our staff comes armed with a can-do attitude each day. We expect nothing less. An attitude can make or break a team and we go above and beyond to motivate, encourage, and reward our team. You will find a tremendous amount of determination, integrity, commitment, adaptability, and personal accountability in our staff. They are valued team members and we love to see them succeed on both a personal and professional level. VoiceNation is committed to each member of our team and we take pride in the people who have accepted the challenge to grow personally and professionally with us. Our staff looks forward to coming to work each day. With a positive work environment, and awesome coworkers, who wouldn’t want to come to work? Oh yeah, and we have a “fun team” too! Yep, that’s right. This team works hard each day to help make the daily experience unique and enjoyable for every employee. Make sure to check out our Facebook page to see amazing photos of our company culture. Every week, we post a weekly recap blog to give you a behind the scenes look at our company culture, complete with highlights from our office shenanigans, fun days at the office, more importantly outreach initiatives. 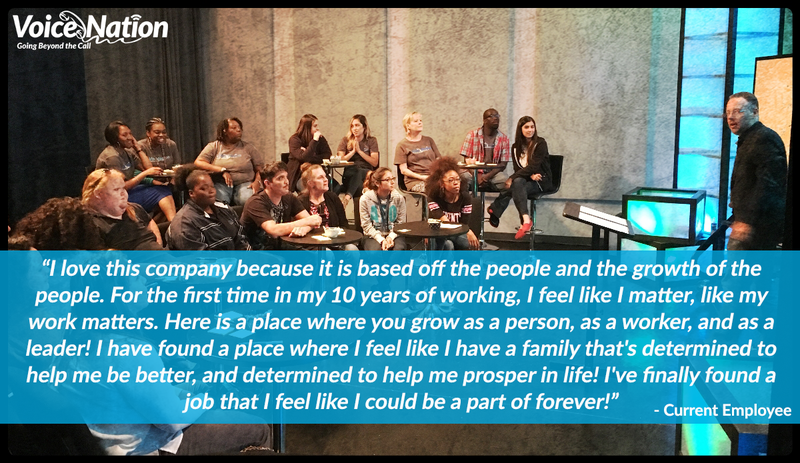 Being a part of VoiceNation doesn’t just mean a career with an innovative company. Through our non-profit organizations and community outreach initiatives, we provide charitable contributions to businesses and individuals on a local, national and global scale. Plus, each month, our staff has the opportunity to volunteer for charities they are passionate about through our Employee Volunteer Program. We believe, together, we can empower the world. We are company driven by a team that produces results. Our growth and success is visible proof of our business strategy and company culture. It’s why we are an industry leader in business telephone services and why we add only the best of the best to our call center service team. Staff development is a huge part of the plan for each employee here at VoiceNation. We make valuable contributions to the growth of each individual to promote excellence. Every person employed with us participates in ongoing training. That way, we find the hidden potential in each of our staff and boost those important skills that will help them grow, both personally and professionally. We want our team to excel in all aspects of life and we acknowledge individual talents. After all, our people are what drives our company and helping them reach their potential is a win-win. As the leading virtual phone and live answering service provider, our employees are our most important asset. They are the people who interact with callers each day representing YOU, our customer. Our employees participate in continuing education by attending webinars, training events, educational sessions, and reading self-help books. All CCRs (Call Center Reps) attend weekly staff development sessions. These sessions cover various topics including how to handle difficult calls, proper phone etiquette, and improving customer service. Other sessions might include challenge contests for CCRs to improve their knowledge of customer accounts. The goal is to know and understand each account from memory recall. In our corporate office, staff development is just as important. Management teams and their staff continually study self-help books that focus on various topics, such as leadership, customer service, attitude, perception, habits, and more. During the bi-weekly staff development meetings, management and staff dive deep into a book study, focusing on the key principles and life lessons outlined in the book. Between meetings, we challenge our staff to put those lessons learned into practice. Because practice makes… well, we know that no one is perfect, but it doesn’t hurt to always do our best! Make sure to follow our blog for bi-weekly staff development meeting recaps! Our team is encouraged to think outside the box and we give them the opportunity to share their creative ideas and provide the safety net to fail forward, when necessary. An environment of learning and growth is part of the daily life at VoiceNation. Our team is encouraged to think outside the box and we give them the opportunity to share their creative ideas and provide the safety net to fail forward, when necessary. Each member of our team plays an important part in making sure things run smoothly, efficiently, and successfully. VoiceNation is committed to each member of our team and we take pride in the people who have accepted the challenge to grow personally and professionally with us. Why is Staff Development so Important? VoiceNation is a strong believer in the importance of continued development in reading, comprehension, and writing skills. What’s a PIE Meeting? At VoiceNation, we hold monthly PIE Meetings in honor of our core values- Passion, Innovation, and Excellence. It’s a fun time for staff to get together and celebrate the success of our company. We review company initiatives, talk about the latest book read, share techie ideas, and best of all, receive really cool acknowledgment awards. By helping our staff grow and soar to new levels, the benefits to our customers are endless. Our team is well-rounded, highly trained, and happy. We have a company culture unlike any other. Overall, our people are a part of business that puts people first, whether it’s in our office or yours. Our customers get the benefit of working with a team of people who are motivated and hungry for success. Our answering service and our staff are the standard of excellence. This mindset is one reason why thousands of businesses nationwide choose VoiceNation as their preferred call center partner. Tramadol 200Mg Online VoiceNation continues to innovate in the telecommunications industry through excellent service, and passion for seeing businesses succeed.